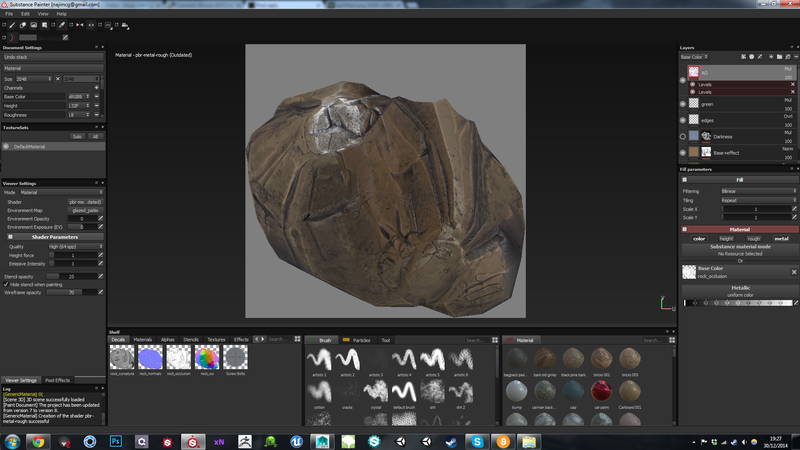 Here are some handpainted rocks i textured with Substance painter . Very nice, I really like the top rock. You mind posting the wire frame and UV map of the top rock? I am curious how many polygons that is. How long did it take you to paint? 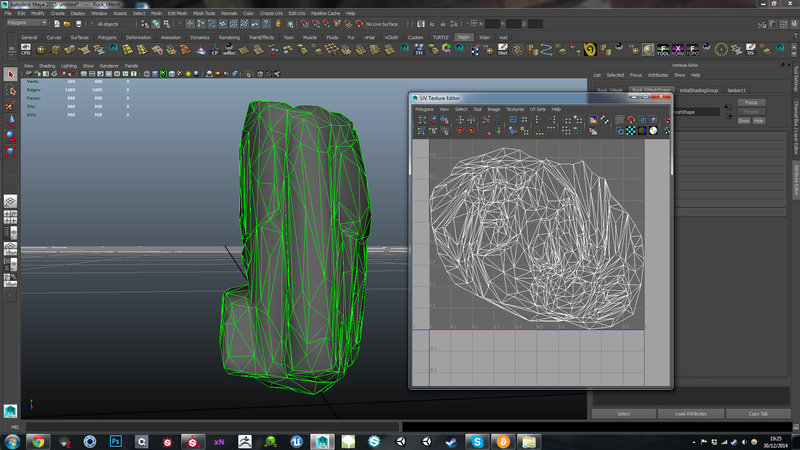 Thanks mike !Of course i post the uv map and wireframe . I did the paint in 20 minutes . 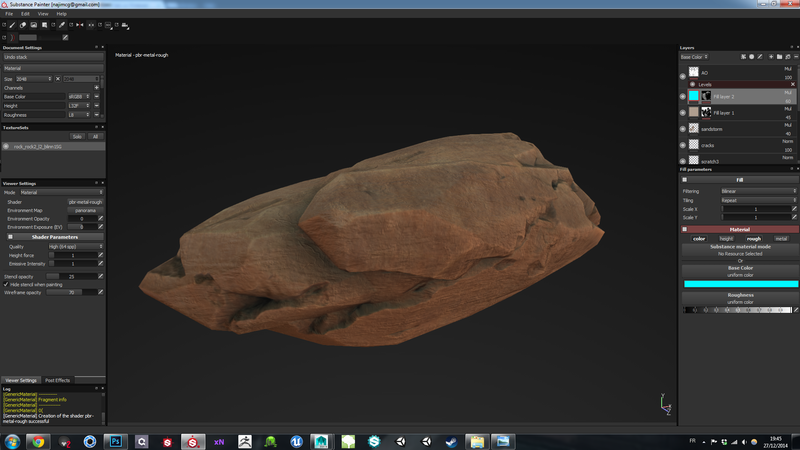 Here is the uv and the wireframe of the rock ( realy simple uv , normaly i always unfold properly , but in this case a simple automatic unfold and decimation was more then enough ). I really do like the texturing job. I am doing some things for UE4 props wise so this type of stuff is motivational. From the top screen shot, it doesn't look like you used substance effects, so is this a straight painted model? No auto masks is my question, just reveling under layers? BTW, if you get them in UE4 scene, post an image! I actually used a substance effect like MG-DUST for some small adjustements ( but the whole stone was handpainted , so no texture used). dont pay attention to the ground , it was just there to have a quick look on the scene . I was having a look/deconstructing that shader Unreal provide in the desert buggy example. Setting up the terrain like that in layers and angles would really show off assets like this when combined with the same texturing you are using, great! I wouldn't call this necessarily hand painted. And specially when i watch your layers and the way you did your unwrapping. 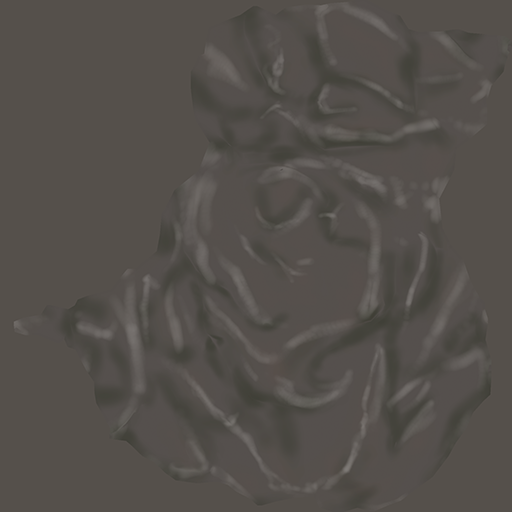 -use stuff like surface noise and crack brushes. -4 Bake all the maps you need in SD. -5 to finalize use some brushes like dirt and cracks to loosen the baked look. And if you baked a position map you could start playing with some moss and stuff. Little problem with your rock Ron , you used a frog leather texture material , that is were it isnt hand painted . The handpaint is a technic where you dont use any kind of pre made texture , you paint all on your own ( you can of course use effects like dirt or edge wears ) . 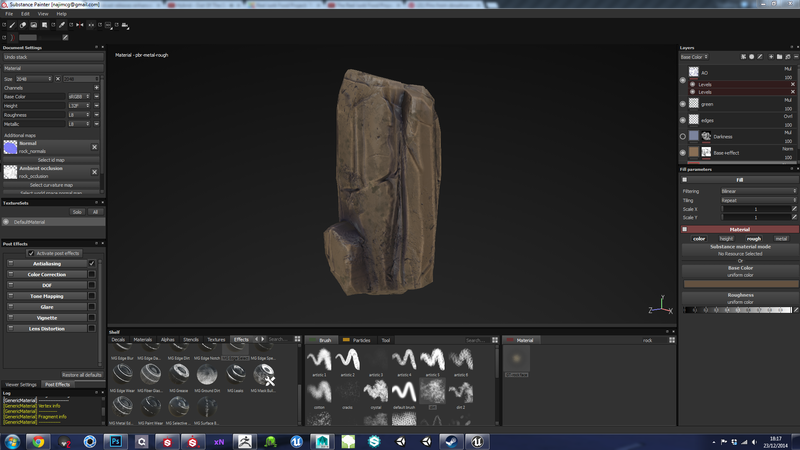 And i realy dont see the link between my rock and the 3Dmotive pipeline , 50 % of mine was different of what you described ( they use ndo , i use substance painter and zbrush ). 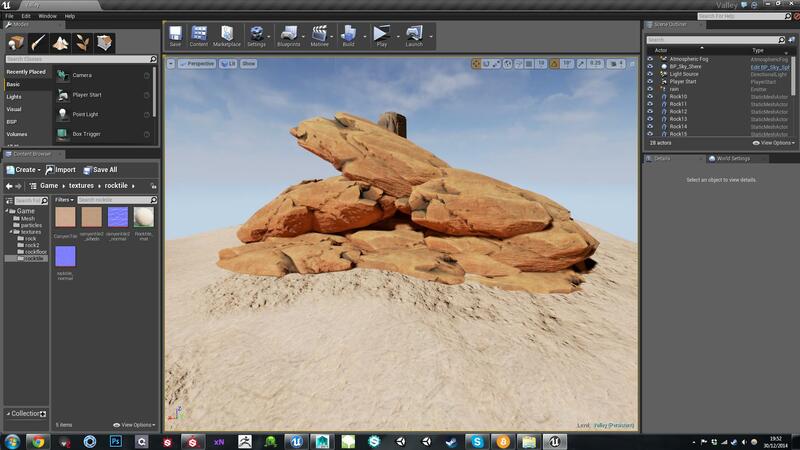 Also watchout for your rock , the texture you made with the frog leather dont give the "rock" effect to your rock. By that i mean , did you use refferences ? What kind of rock do you try to achieve ?. Hope you will post your rocks on your own thread so we can see your updates , it kinda floods the lisibility of mine if you understand what i mean . As you say your self, as soon u use any pre made texture. So this also counts for Ao or any other baked maps. The rock that i made only exist of pre made bakes ( the frog layer is turned off) and is done in 5 min so by no means any master piece. I just wanted to explain the technique u used to TeotiGraphix. I think you took my message bad , that was not the point of it . Like i emailed you , i will be the first to encourage you of posting a thread of your rocks , but for the lisibility lets keep this thread with the images of the one who made the thread ( just a simple principe , dont take it bad ) . Your technic is nice , but it isnt mine so if TeotiGraphix have a question about how i made it , i would explain it with pleasure . How is it handpainted ? Well simply the whole Albedo ( i never heard that you couldn't make a handpaint texture without a pre baked normal or AO..).